The breakout star of the World Cup has showcased speed and skill that betray the fact that he is just 19. He has three goals in the tournament and is a key to France’s dynamic counterattack. The Croatian captain debuted for the national team in 2006 and remains the heart of the team. Modric, 32, has a pair of goals and an assist in Russia. 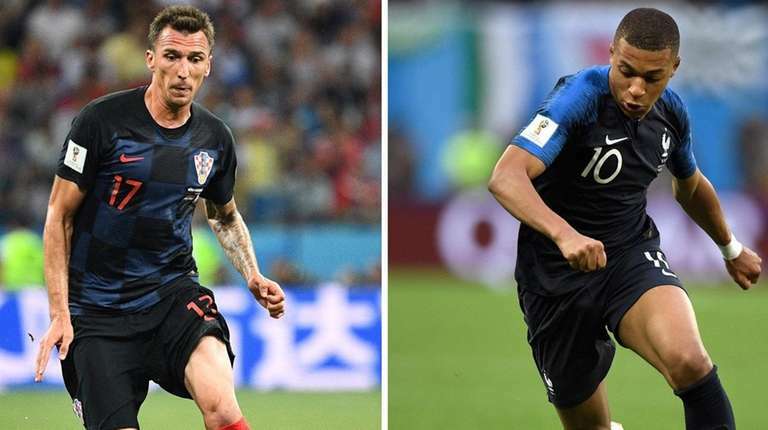 While France has no shortage of dynamic attackers, like Mbappe and Antoine Griezmann, it is in the final largely on the strength of its defense. It has as many shutouts as goals conceded (four) in its six matches. Centerback Raphael Varane and defensive midfielders Paul Pogba and N’Golo Kante have been the key kogs. Croatia has no shortage of creative midfield players, led by Modric and Ivan Rakitic. They are joined in the midfield by Ivan Perisic, while Mateo Kovacic is an option off the bench. They have helped the Croats maintain a possession rate of nearly 55 percent in the tournament. Making the final: After leveling its semifinal against England in the 68th minute, Mario Mandzukic fired home from close range in extra time to send Croatia to a major tournament final for the first time. Penalty kick wins: Only one team had to win two consecutive knockout round games on shootouts until Croatia pulled off the feat. The Croats sent host Russia home in the quarterfinals after eliminating Denmark in the Round of 16. Pavard’s goal vs. Argentina: France trailed Argentina by a goal in its Round of 16 match when the ball found Benjamin Pavard on the edge of the 18-yard-box. The defender was an unlikely candidate to score, but his screamer found the back of the net to level the match in an eventual 4-3 win. Lloris’ save vs. Uruguay: Leading 1-0 late in the first half in the quarterfinal, goalie Hugo Lloris dove to his right at full extension to deny a close-range header. Croatia is the smallest nation — with a population of 4.2 million — to reach a World Cup final. Uruguay (population 2.2 million at the time) won the decisive group match to clinch the 1950 World Cup, though it was not technically a final. If Croatia wins, it would only be the ninth different country to lift the World Cup. The winner will be the fourth consecutive European World Cup champion and fifth in sixth tournaments. Croatia’s previous best finish at a World Cup was a third-place finish in France in 1998. It lost to France, 2-1, in the semifinals. This is France’s third final, winning in 1998, and losing to Italy after penalty kicks in 2006 (a match most remembered for Zinedine Zidane’s headbutt of Marco Materazzi). Croatia’s game is predicated on possession, but France has been comfortable ceding possession and defending well, before striking on the counter-attack. And while Rakitic and Modric are elite passers, they are not the most fleet of foot, which could spell problems against the lightning-quick French counter. Croatia has only conceded five goals in the tournament, but has allowed 13 shots per match — 70 percent of them have been inside the 18-yard box. Add in a fatigue factor — Croatia’s last three matches have gone to extra time.